Amp Telecom offers businesses of all sizes the chance to compete in a corporate world by offering a cost-efficient, easy to manage phone solution for all of your business needs. Providing an all-in-one VoIP phone management service for businesses, Amp Telecom tailors their product packages to suit the needs of each individual customer. Features range from voicemail management to follow-me call forwarding and beyond. In short, it's an all-encompassing call management product that keeps phone bills low and call volumes flowing. Amp Telecom keeps voicemail management convenient with Voicemail Storage and Voicemail to Email & Text features so you can get your voicemail wherever and whenever you want. Amp Telecom also has IVR, call reporting and extensions management. Authentication: Get your own API key via the admin portal to begin the session. Send this key along with your API request. Active calls: Once connected, you can view all active calls run through the system. Call history: Developers can view call history for the last 90 days of use (make sure to set the timezone field correctly). Calling: Set up your system so agents can make phone calls from any extension within the system to any valid telephone number or extension. Reporting: You can also access stored files from within the system for monitoring, reviewing, and reporting. Additionally, plans come with 2GB of storage, and the upper three plans have competitive long distance rates. Note that these prices are for a 2-year contract. One-year and month-to-month contracts run slightly higher. In general, the whole idea behind Amp Telecom services is high mobility because the entire purpose of the solution is to offer companies the flexibility to do business wherever they are. Especially for small- to medium-sized businesses, this often means taking and making business calls while on the road or out of the physical office. Amp Telecom equipment and services are easy to transfer from one location to another. As a VoIP and multi-device solution, Amp can be used on different devices, in various locations, and by multiple users simultaneously. This is a benefit for small businesses that are either moving locations (perhaps if you are upgrading to a bigger office after a staff growth) or generally do business on the go. The connection can be used at home, in the office, or anywhere in between depending on the plan. Amp Telecom’s phone packages are easy to scale up and down as your business fluctuates. The month-to-month package is an optimal choice for any company that is unsure of the projected business growth over a given year—for example, startups and seasonal businesses—as this will give you the kind of leeway to change your service plan on a month to month basis depending on your needs. Also, month-to-month plans are the most cost-efficient option for small businesses that aren’t well established yet, since they only pay for the exact services, features, and call amounts that they want/use. Amp VoIP setup was fast and easy. The process took us less than an hour, and we were able to quickly resolve a small connection issue through the helpful customer service personnel. Management of the system is run through the admin portal. With a clean, well-organized UI, it was easy to configure all of our settings preferences. With separate admin and user portals, Amp lets you maintain control of the overall system without having to worry about the smaller details that individual agents and employees want to use to personalize their experience. The open API access also allows businesses to customize their experience according to their needs and situation. One final benefit to Amp’s services that many other out-of-the-box solutions don’t offer is the private consulting and planning option. You can sit with a competent representative to discuss the options so that you can create and manage the best system for your business needs. New Amp customers are outfitted with Grandstream GXP1610 telephones. These solid and reliable phones come complete with all the technological trappings of a modern device including 132x48 LCD screen and state of the art security encryption technology (SRTP and TLS). The GXP1610 is able to hold up to 200 calls in its history log, is conference calling compatible, and even provides 3 XML programmable soft keys and dual 10/100mbps ports for the most flexible user experience possible. The one drawback that can be said about Amp Telecom’s customer service offerings is that there are only two contact options. We would like to see more information on the website such as FAQ sections, blogs, user manuals, or video tutorials, and a live chat feature would go a long way towards increasing customer satisfaction. That being said, the customer support on offer is top notch—Amp Telecom was a pleasure to interact with. The staff members we were in contact with were knowledgeable, helpful, and courteous, important traits when dealing with businesses. The customer service staff can be reached directly via its toll-free number (listed below) or through the online contact form. Simply enter your name, email address, and detailed question, and a service representative will get back to you in a timely fashion. Amp Telecom offers competitive rates on long distance, international calling. Because it is a VoIP system, the calling costs are significantly lower than traditional telephone systems, and this company is happy to pass the savings along to its customers. In short, small businesses that are always trying to save money where they can will be surprised at the significant savings Amp’s VoIP international call plans offer. Some customers even noted close to 70% reduction in phone bills thanks to this service. Additionally, Amp Telecom’s VoIP calls are known for being clear, reliable, and consistent, so you don’t have to worry about important overseas phone calls being interrupted or cut off in the middle. The call quality will always be reliably clear, so there are no misunderstandings, whether you are talking to a business partner, staff member, or potential client. The Automatic Call Distributor lets your customers, clients, and partners call into one local or toll-free number, and has the call directed to the exact team, agent, or extension it needs to go automatically. There are no delays, complicated transfer procedures, or long distance calling inconveniences. Just a simple, direct call and connection. With the added ability to connect multiple devices to one line, you can make sure that your agents and other staff members are always on call and where they need to be, even if they're away from their desk. Amp Telecom was founded in 2015 and is currently one of the major providers for business telephone management services. A small but resourceful company with an A BBB rating, Amp Telecom’s offerings include PBX systems, Voice over IP lines, converged communication, and other communications packages. Amp Telecom specializes in customization for small and medium-sized businesses. 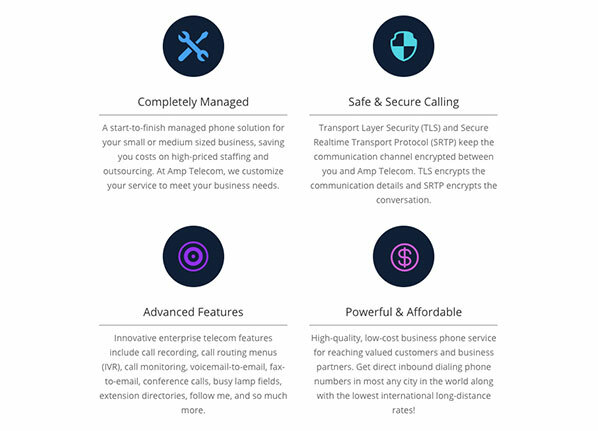 With strong encryption security features, innovative technology, and competitive local and international rates, Amp Telecom is a good contender for best business VoIP service in the market. In addition, the $500 savings challenge ensures that you save money on your first bill or you'll receive a $500 check in the mail - no questions asked. This kind of guarantee offers customers security and the reassurance that they are really getting their money’s worth. When you view its features set alongside the quirky personality that is apparent from the company’s promotional videos, it’s apparent that Amp Telecom has the right combination of fun, professionalism, and benefits ideal for today’s modern business world. Sarah Pritzker is a content writer with years of experience and a keen interest in the vast world of online consumer products. She enjoys helping readers make sense of the options on the market in industries including POS, VoIP, hosting and VPN.